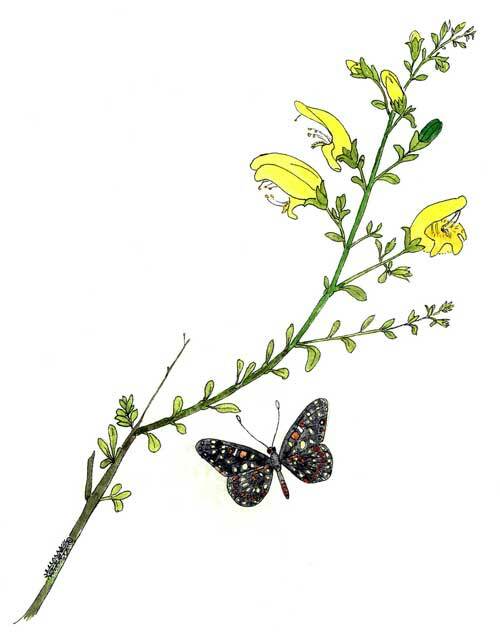 Painted from live specimens found at Sugarloaf Mtn., e. Maricopa County, Arizona on 29 March 1992. The Chalcedona Checkerspot is shown at bottom center, while the caterpillar is on the plant stem at lower left. This flower was photographed in a deep canyon on the southern flanks of the Bradshaw Mts., Yavapai Co., Arizona on 24 May 2009. The 'beard tongue' on the lower lip is easily seen here - it is the modified fifth stamen ('pentstemon') - which serves to brush from the bumblebee the cargo of pollen grains trensported from previously visited flowers. FLOWERS: Bright yellow snapdragon flowers open Mar. to May. 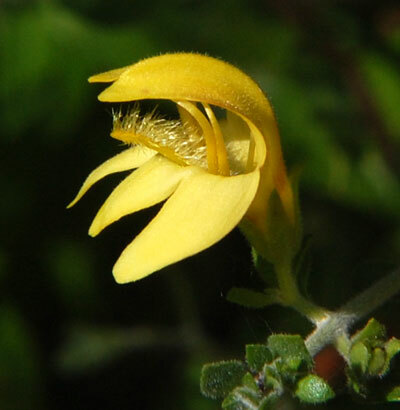 SHRUB: A woody shrub below, with considerable herbaceous growth above reaching 1 to 2 m. in height. RANGE: Upper elevations in transition to chaparral from eastern Pinal to southern Yavapai Counties, often in partial shade of rocky slopes. LEAVES: Small, simple, spatulate and opposite on the stem. The leaf petiole has a curious swelling where it joins the stem. FRUIT: Dry capsules, mature in May, then split open to reveal many small seeds. A search of the plant in early spring will often reveal the 3 cm long, spiny, black caterpillar of the Chalcedona Checkerspot, Euphydryas chalcedona. Through its range in other parts of the west this butterfly uses various penstemon species thus confirming this shrub's taxonomic affinity to the herbaceous Penstemon species.